Looking for a way to chase those midlife blues and still maintain a sense of style? Check out this wine bag. It’s at Scandanavian Design Center and an assortment of other places online. My friends saw it on a recent wine weekend in Southwest Michigan. Just stick your bag of wine in, and you have a fashion-friendly alternative to dragging a box of wine around wherever you go. Definitely time to swap out the old bota bag for this! 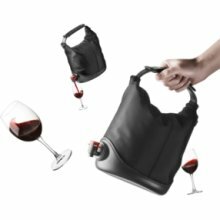 Once word gets out about your new wine bag, you’ll be everyone’s best friend. This entry was posted in Totally Random and tagged boxed wine, midlife crisis, wine, wine accessories.